A collection of mindblowing card magic that you can perform with ANY borrowed deck. NO SETUPS. NO PROPS. NO GAFFS. How often has this happened to you - you're at a party and someone comes up and says 'hey, I hear you're a magician... can you show me a trick?'. Your mind goes blank. You have none of your gear with you - no thumb tip, no sharpie, no gaff decks, no magnetic ring, nothing. All you have is a deck of cards. (Or maybe your new friend hands you THEIR deck!). 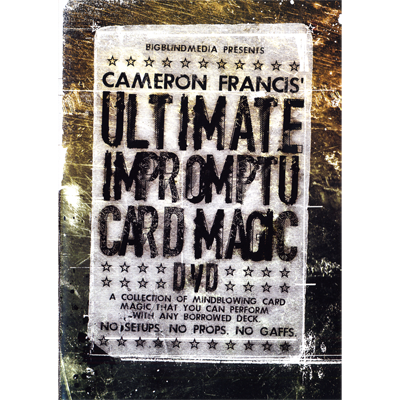 On Ultimate Impromptu Card Magic Cameron Francis has collected together a host of absolutely KILLER magic that you can unleash at a moment's notice. These 14 routines are easy to perform, but shockingly powerful. Learn these tricks and you'll NEVER be stuck for a spectator frying miracle again! !